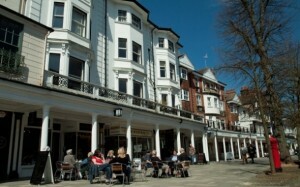 Tunbridge Wells: the south-east and London is the most likely region to experience house price growth in 2013, Halifax says. House prices will remain flat in 2013 as first-time buyers continue to struggle to secure mortgage loans, Halifax has predicted. The lender said that while the outlook for house prices “remains more unclear than usual” it expects “little change” in house prices in 2013. Prices will remain within a margin of -2% to 2% before ending the year broadly in line with today’s level. Martin Ellis, Halifax’s housing economist, said rising energy bills and stagnant wage growth would continue to restrict the number of homebuyers, while the outlook for the UK economy as a whole remains unclear. In August, the government launched a Funding for Lending scheme designed to boost mortgage availability, but many of the subsequently available loans have been targeted at borrowers with large deposits, and lenders have continued to focus on borrowers with the cleanest credit histories leaving many would-be buyers struggling to raise funds. Recent figures from the Council of Mortgage Lenders showed that in London the number of first-time buyers reached its highest level in three years in the third quarter of 2012, but remained well below levels seen in 2006 and 2007. Despite low interest rates meaning mortgage payments take up just 26% of new borrower’s take-home pay, compared to an average of 36% over the past three decades, Ellis said restricted mortgage availability for first-time buyers will force more people into the rental sector, which would “probably result in further growth in the buy-to-let sector”. “Conditions will remain tough for first-time buyers with no radical change in their circumstances expected. As a result, the numbers of first-time buyers are likely to remain low by historical standards,” he said. Halifax added that house prices rose by 1% in November, taking the average price of a home in the UK to £160,879. But they remain 1.3% lower than they were a year ago, while prices in the three months to November were 0.7% lower than the previous quarter. “While an impressive looking rise in itself, this has to be put in the context that house prices had fallen in each of the previous four months including a drop of 0.1% in October,” Howard Archer, chief economist at IHS Global Insight said. London and the south-east is the most likely region to experience house price growth in 2013, Halifax added, as overseas buyers continue to snap up property in the capital and surrounding areas as a means of protecting their money from ongoing turmoil in the eurozone.